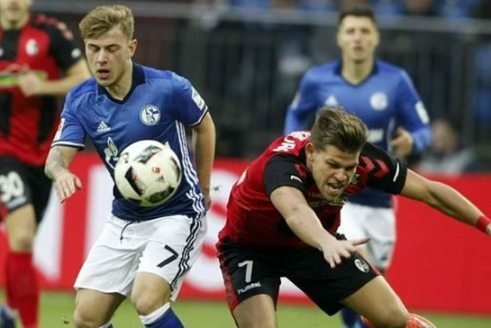 Freiburg - Schalke 04 predictions, betting tips and preview 04 Nov 2017 – The hosts are able to take all three points. Freiburg - Schalke 04 predictions for Germany 1. Bundesliga match at Schwarzwald-Stadion, Freiburg. The guests seem to be overrated. Read on for live streaming info and our free predictions. Do you want to watch live streaming of Freiburg - Schalke 04 and bet live? Go to bet365 Live Streaming and place winning bets! Freiburg are only one point above the relegation zone after ten rounds, while the team demonstrates quite good football, especially at home venue, where they not suffered a single defeat so far. The main reason for such unsuccessful performance of the German Brazilians this season is helpless play on the road, where Freiburg managed to score only one goal, conceding sixteen! However, when it comes to home records the hosts are among the best, because they already managed to beat solid Hoffenheim and tied with such clubs as Dortmund and Eintracht Frankfurt. Yes, today a hard-hitting rival comes to visit, but the Miners failed to beat Freiburg last two seasons either home or away. Is another guests` failure possible today? This scenario looks particularly likely, taking into account how unstable Schalke 04 look now. Freiburg suffered a crushing defeat in Stuttgart last round, and now wish to be rehabilitated in the eyes of their fans. Schalke spent October successfully and come to visit with four rounds without defeats, but this club has always played poorly on the road and hardly anyone can call them a stable team. Apart from the unexpected home victory over Leipzig in the first match of the season, the Miners were able to beat only four teams from the bottom of the standings. Of course, Freiburg’s offensive line looks weak, but do not forget that even Dortmund could not score at Schwarzwald-Stadion. The chances of success for both sides today can be assess as even, but the bookmakers believe that the probability of home win is only 23% and it is unlikely that is true. The stake on a home side seems to be a value bet.